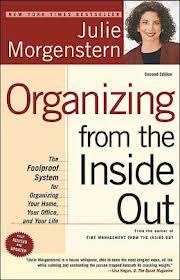 Organizing From the Inside Out by Julie Morgenstern is a game changer. In it, she explains the basic steps to take for you to tackle all of your organizing undertakings, no matter how big or small. She also provides room-specific plans of action for organizing your entire house. But what really sets this book apart from the pack is the beginning, which guides you to find the root of your disorganization. We all have different personalities and experiences that shape who we are. Morgenstern breaks down how to identify our individual organizational hang ups and work with our personality, rather than against it. She believes being organized is a completely learned skill that we must educate ourselves on and then practice. By discovering why we do what we do, we are able to develop workable, long-lasting systems.